Relax by the pool while sipping a refreshing cocktail. The fitness center has everything you need to stay fit. The resort is home to the only indoor water parks in Myrtle Beach. Dunes Village Resort is located right on Myrtle Beach. Children will love the indoor waterpark, waterslide and the kids club. The indoor lazy river is the perfect way to unwind. You don’t have to go far to enjoy underwater fun thanks to the resort’s huge indoor waterpark. The beachfront Dunes Village Resort was a 2017 TripAdvisor Traveler’s Choice Winner for being one of the Top 10 Family Hotels in the United States. You will know why when you get here. Get your day off to the right start with a visit to the on-site coffee shop, Perk’s Up, it serves Starbucks. Enjoy an espresso beverage (and surprise the kids with a coffee-free frappuccino). When it comes to underwater fun, Dunes Village has it all. Go for a swim in the outdoor pool or lounge on the oceanfront pool deck with a refreshing drink from one of the two poolside tiki bars. If you really want to get fancy, rent a poolside cabana. Cabanas come equipped with a cable TV and DVD player, two lounge chairs, a ceiling fan and a cooler to keep your drinks cold. But wait, there’s more: there are two indoor water parks at Dunes Village. They feature a two-hundred-fifty-foot lazy river, four water slides, and children’s pools. If you’re up for some recreation, check out the basketball court or challenge the kids to a game of mini golf. The little ones will have a blast on the children’s playground; it looks like a pirate ship! Let the kids hang out at the children’s club where there will be plenty of supervised activities to keep them occupied while you hit the fitness center to get your cardio on. After your workout, relax with a massage at the on-site spa. Studio to four-bedroom condos sleep four to sixteen guests. Full kitchens allow you to whip up anything from basic meals to a four-course dinner. Or take a night off from cooking and dine at one of the two restaurants on-site; they even offer room service. One- to four-bedroom condos have in-suite washer/dryers so you can pack light and have enough room in your suitcase for souvenirs. All condos have flat screen TVs with cable and DVD players. Bring favorite movies from home and call everyone into the living room for a fun family movie night. Put one of the kids in charge of picking the movie and another on snack duty. Upgrade to a deluxe condo for a private balcony. Deluxe one- to three-bedroom condos are located in the Palms Tower, while deluxe four-bedroom condos are in the Palmetto Tower. Get started filling that extra space in your suitcase at Broadway at the Beach. The Mole Hole features a variety of gifts, jewelry, and collectibles. The Tsunami Surf Shop features high-end surf fashion for women, men, and children. Broadway Magic has magic tricks and supplies. Kids will love Build a Bear and Toys & Co. Hungry? Dine at King Kong Sushi, Jimmy Buffet’s Margaritaville, or Hard Rock Cafe. Kids will enjoy using their imagination while playing on the interactive exhibits at the Children’s Museum of South Carolina. They can learn about the Scientific Method at Water Works. They can be a contractor at the Under Construction House. The Big Bank will help them learn about money by pretending to be a banker or customer. Go for a family ride on the SkyWheel. 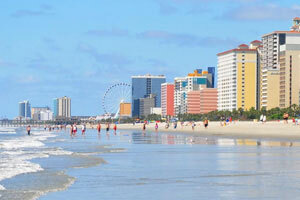 It’s almost two-hundred-feet tall and offers the best views of Myrtle Beach. Golfers should definitely check out Dunes Golf & Beach Club; it’s an eighteen-hole course designed by Robert Trent Jones. It opened in 1949 and was completely renovated by Robert’s son Rees in 2013. Dunes co-hosted the 2014 PGA Professional National Championship.